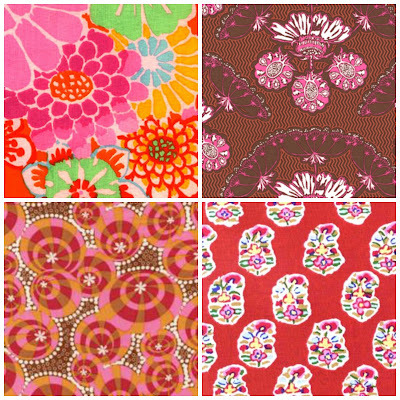 To know me is to know that I love vintage fabric. 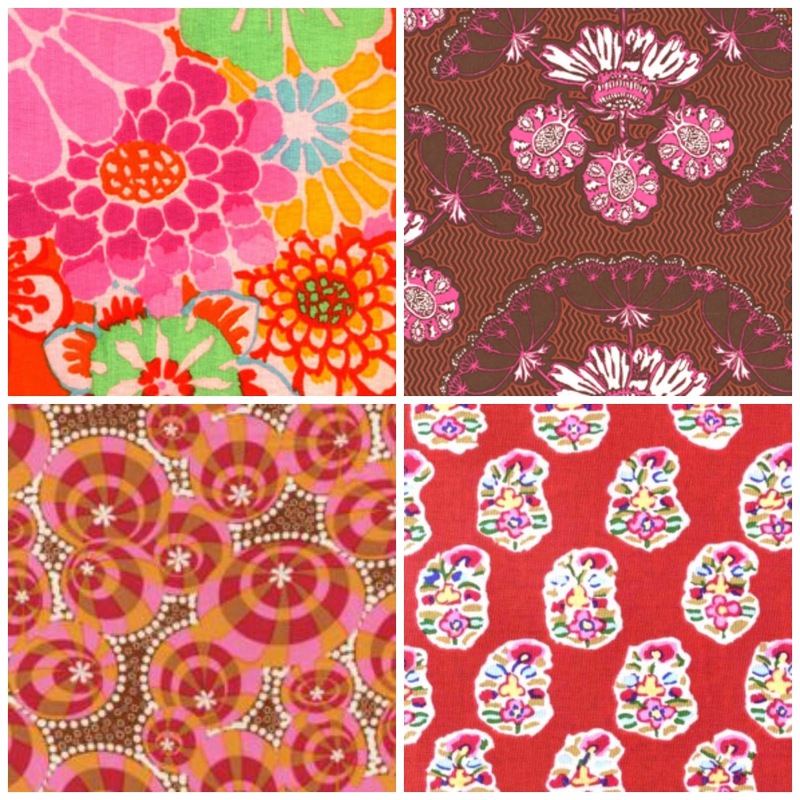 Unfortunately, in the UK, decent vintage fabrics suitable for quilting or dressmaking are pretty thin on the ground and the ones that are around are pricey. 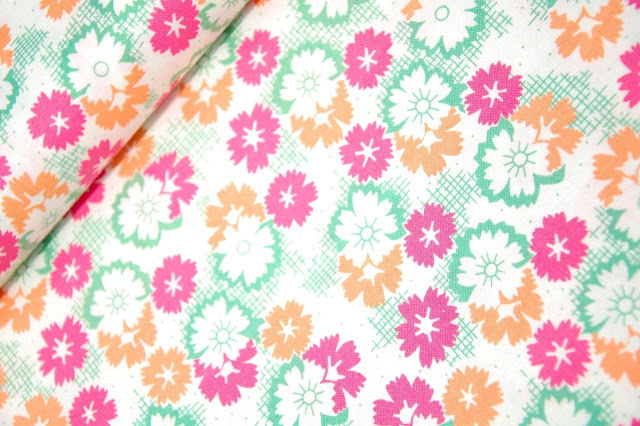 So, I turn to repros and feedsack style fabrics and Eternal Maker has some gems tucked away in its masses of fabrics! 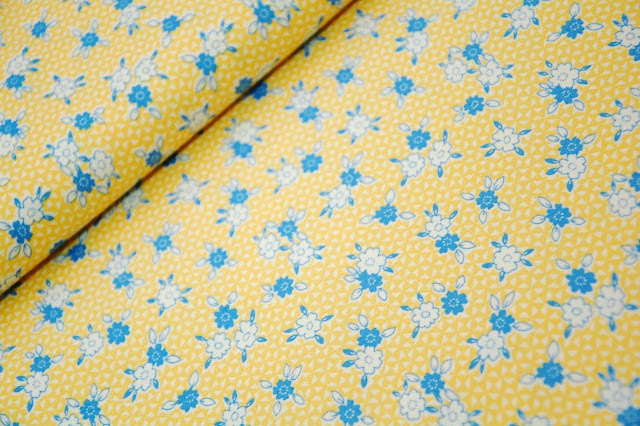 There are a lot of yellow prints, starting off with this beauty from Sara Morgan for Blue Hill Fabrics. There is a tiny hourglass motif for the background. 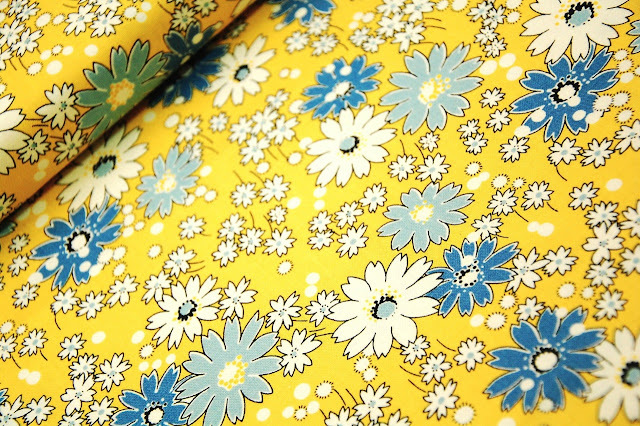 American Jane at Moda always produce great vintage style prints, I have this yellow and blue vintage flower print and I love it. This cut is a bolt end so when it's gone it's gone. This is the same print in a different colour way, a fresher, zestier look. 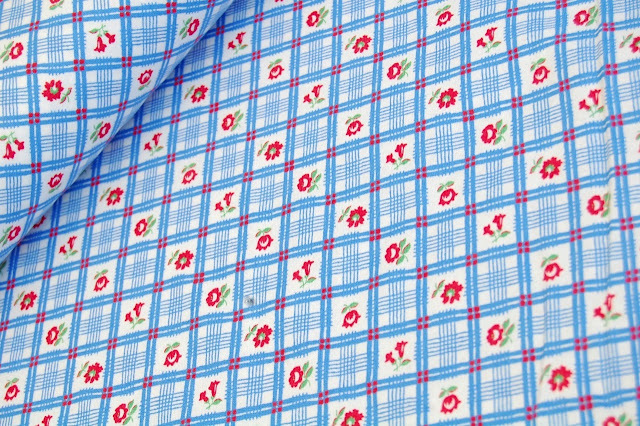 Which makes me think about this blue Windham Strawberry picnic plaid. 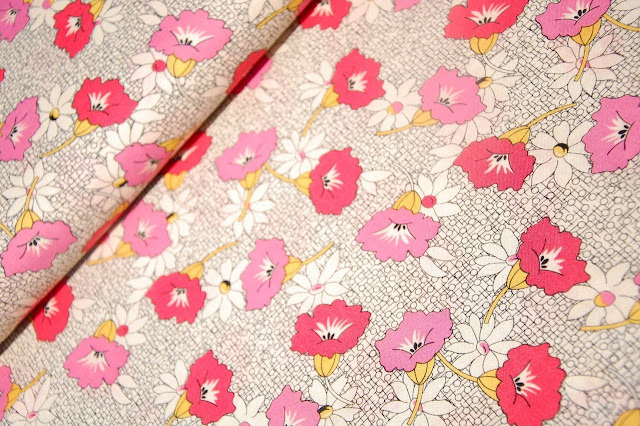 Great colours in this Pink Crosshatch Floral and a bargain price. 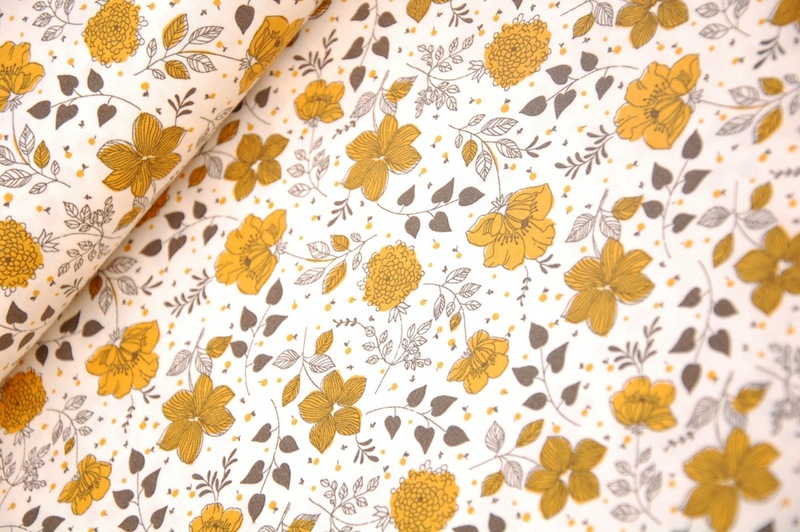 Sevenberry don't seem to produce a lot of fabrics in any of their ranges but what they do put out tends to be stunning, like this mustard/grey floral. 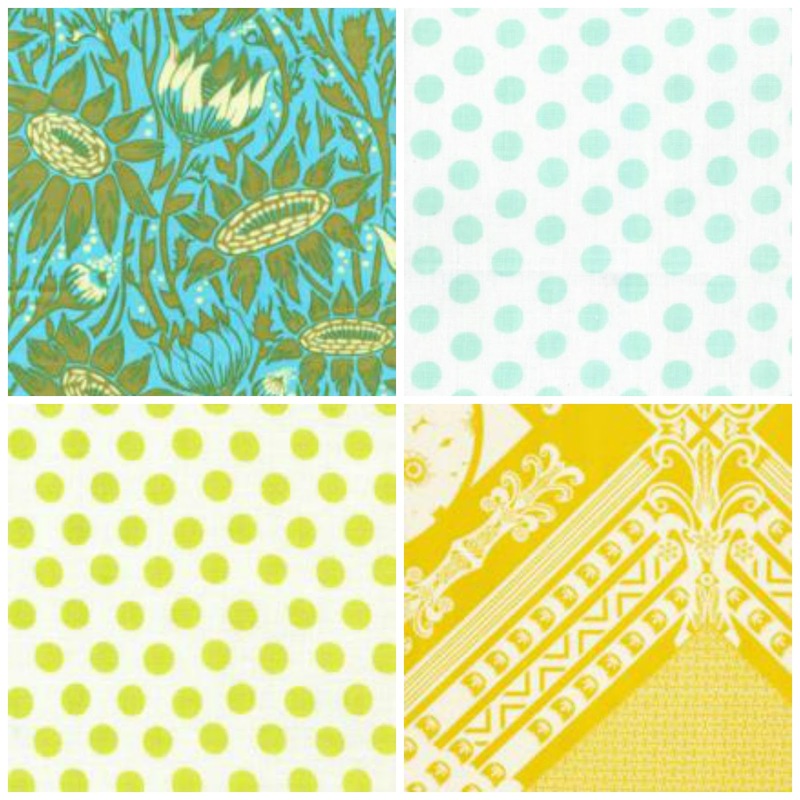 Lecien produce lots of prints with a vintage feel. 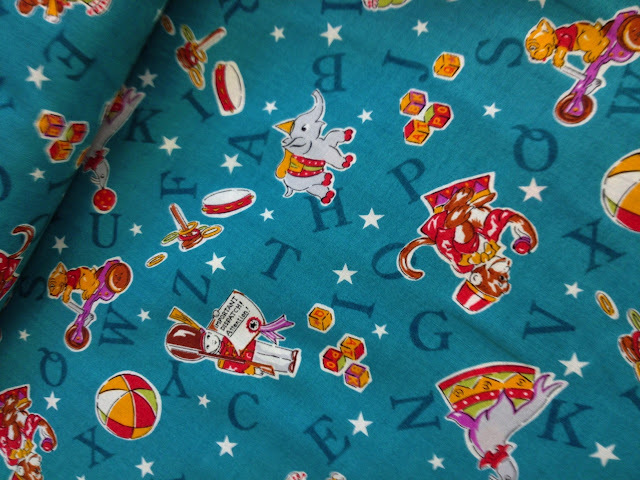 The Mrs March range always contains some beauties including novelty prints like this teal alphabet kids parade. 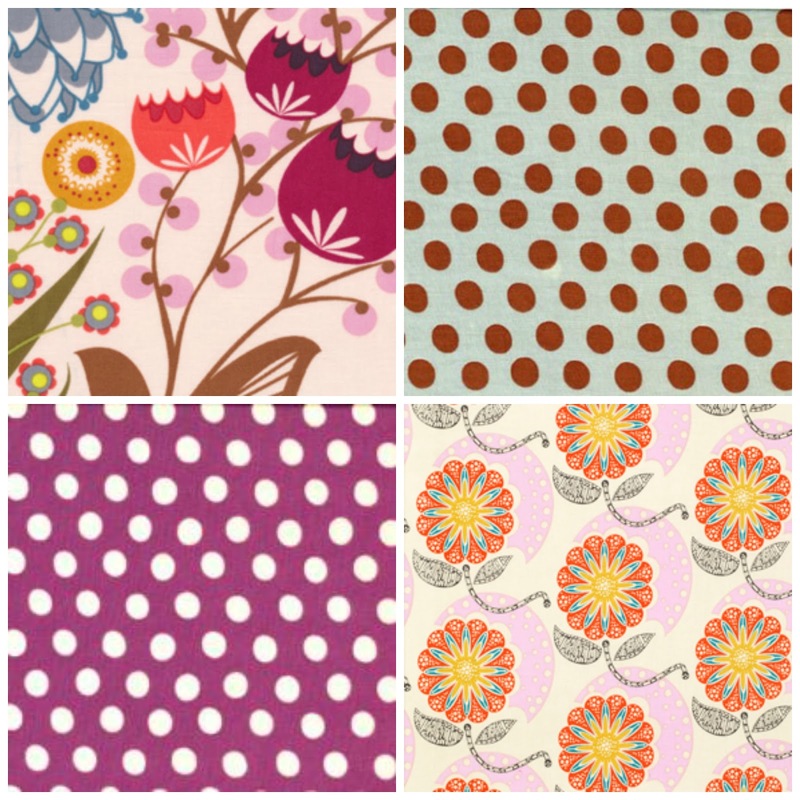 Find more Mrs March fabrics here. 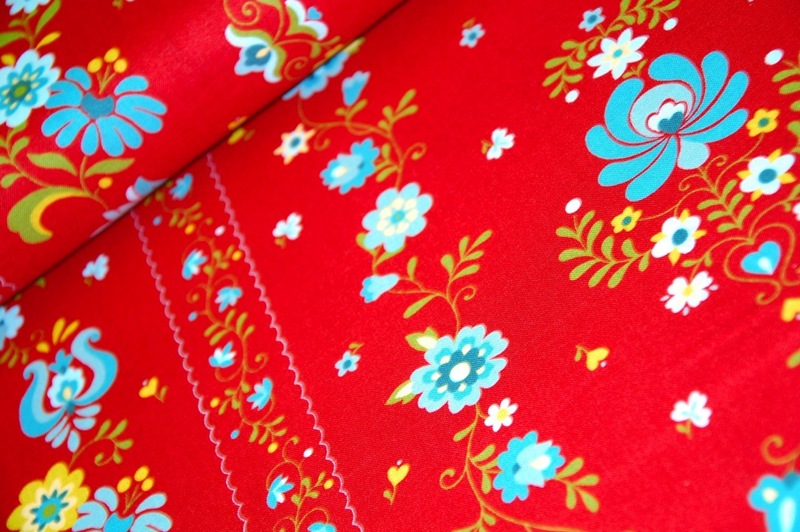 The Folklore range at Lecien has a more recent vintage feel, bolder colours and more European in reference like this red vine floral. There is a black version here and a cream alternative here. 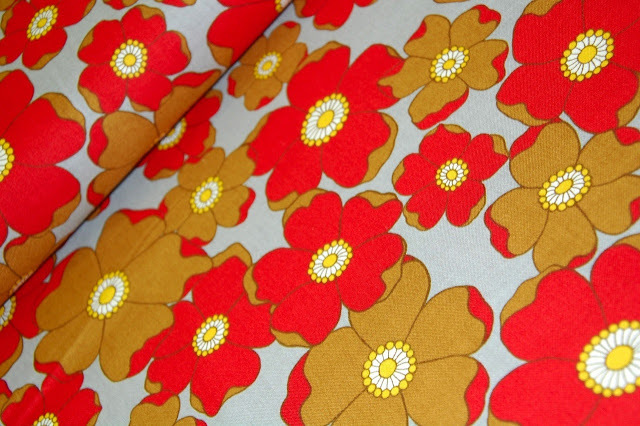 This Lecien print takes me to thoughts of 1970s fabrics, the flowers are big and red and tan has a truly retro feel. 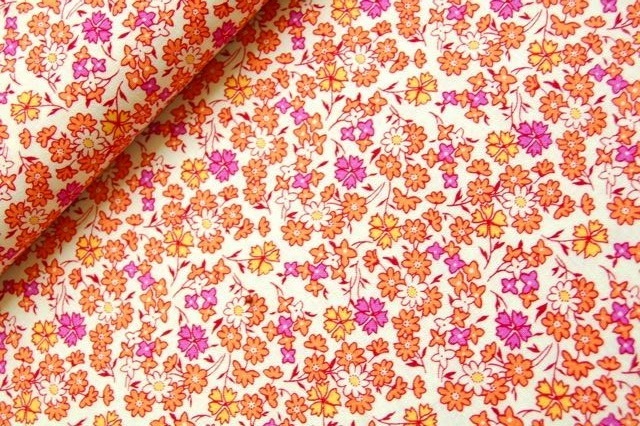 Cream squares- American Country Collection by Lecien, also in blue. 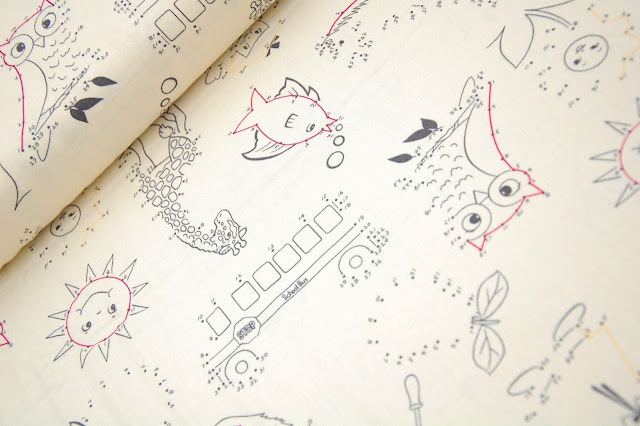 Dot to Dot School Days by American Jane. There is enought lightness and space in this to make it a great background print. 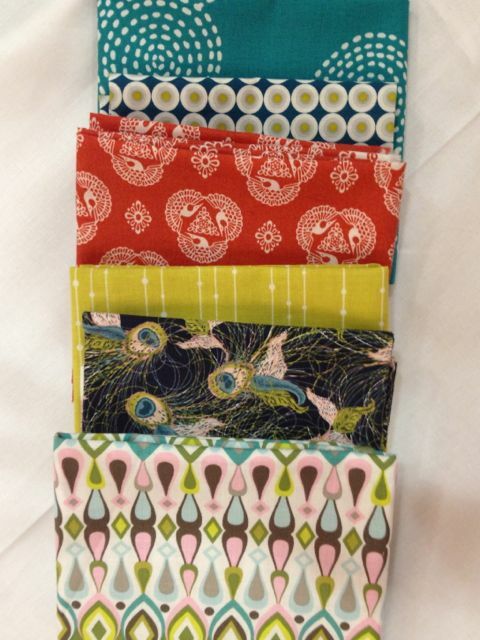 For my monthly visit to Saints and Pinners I thought I would put some fabrics together from Anna Maria Horner and Kaffe Fassett. 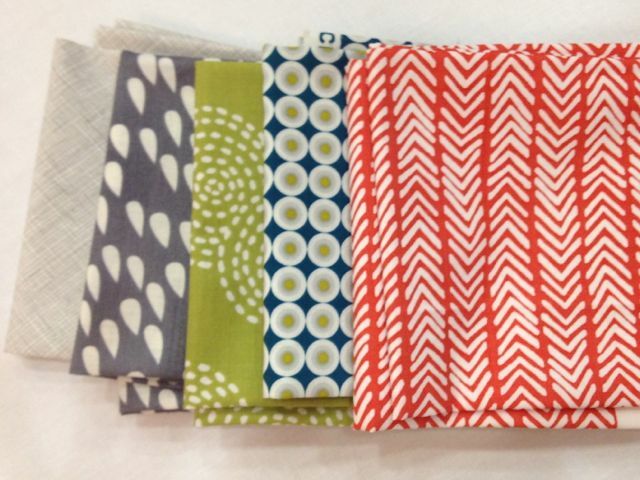 Both are lovers of intense,bold and vibrant colour and both are multi product designers. 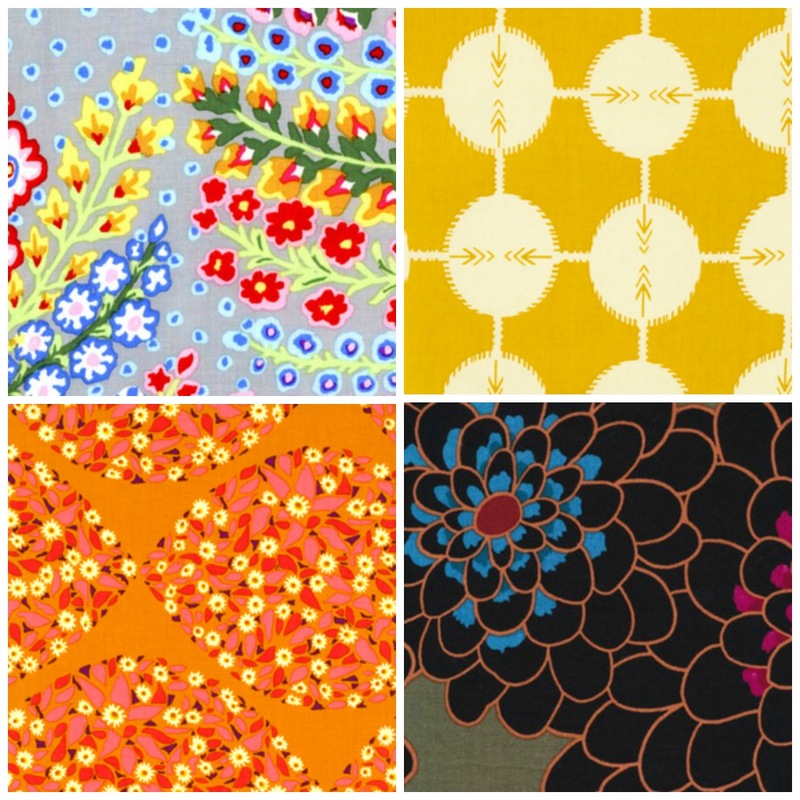 Their fabrics together is a happy marriage- bundle names are purely fictional and a flight of fancy on my part but the important info is that the fabrics are all 20% off when you spend £10 or more. Citrus and bubbles with a hint of elegance. 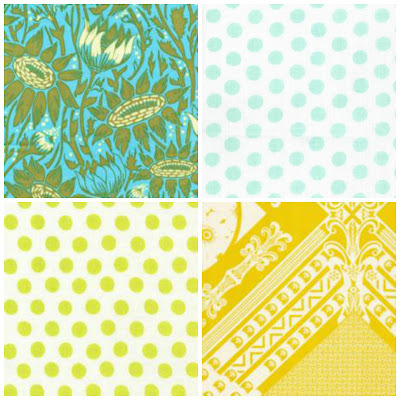 Clockwise: Coreopsis moss Anna Maria Horner, Kaffe Water dots, Framed Citron AMH, Kaffe Sprout dots. Say no more with those colours, love these together! Clockwise: Summer Totem grapefruit AMH, Kaffe grey dots, Cell Structure Americana AMH, Kaffe lilac dots. 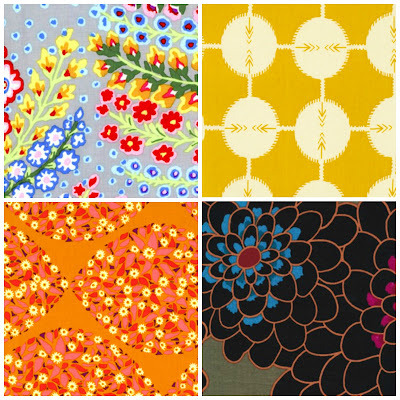 Clockwise: Kaffe Persian Vase grey, Co-ordinates in Saffron AMH, Kaffe Line Dance black, Minds Eye Toast AMH. 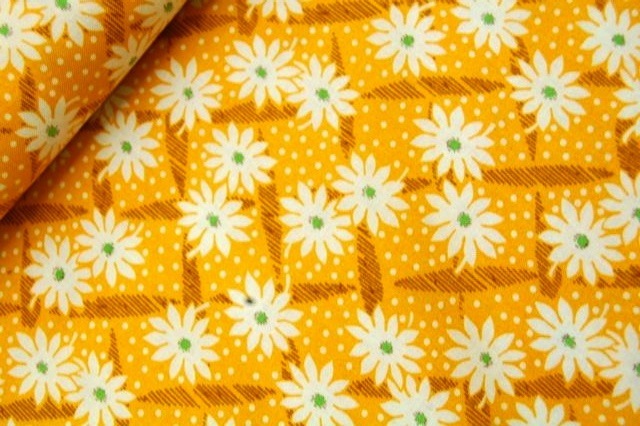 This makes me think of fields of buttercups and wild flowers. 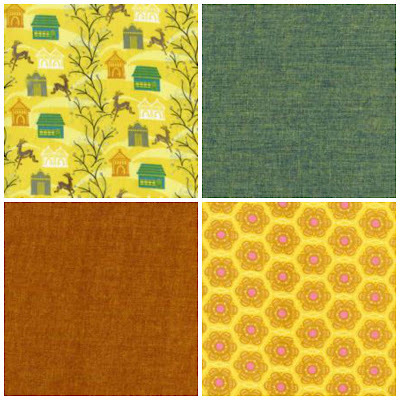 Clockwise: Forest Hills Citrus voile AMH, Kaffe Shot Cotton lichen, Little Honey Gold voile AMH, Kaffe Shot Cotton ginger. Later than planned with this post but I have been gathering pics together from different sources and to be honest feeling a bit flat and tired after the elation of last weekend. 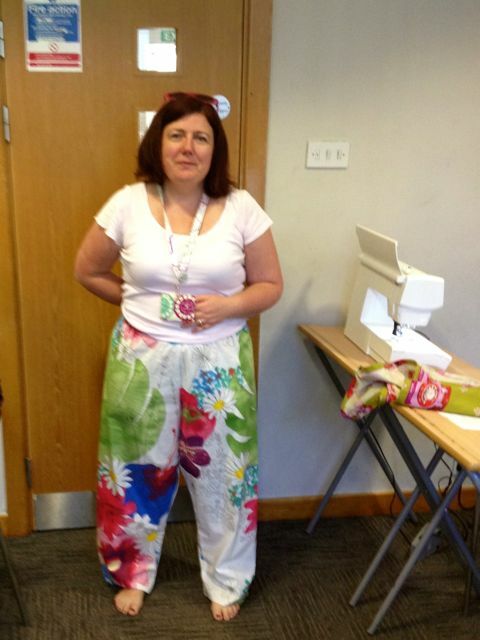 On Friday afternoon I taught a PJ pants class. 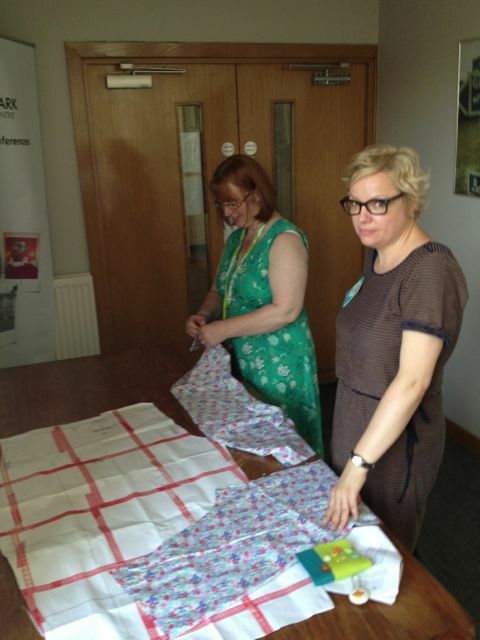 Ably assisted by Trudi ( I was so grateful Trud!) 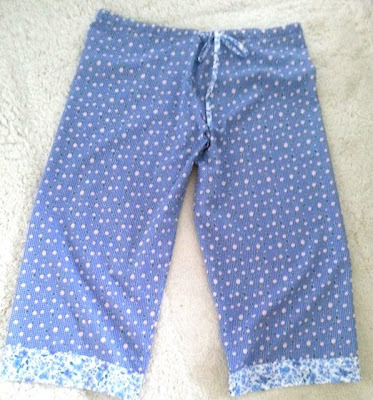 we got our group of keen dress makers pattern tracing, altering, cutting and adding extras to a basic pyjama pants pattern. 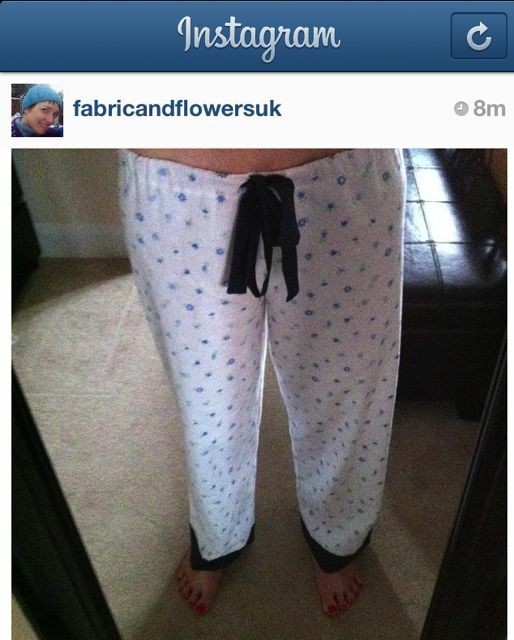 Some were making pjs for themselves, others for lucky husbands and partners. The big tables in the upstair corridor were perfect for tracing the large pattern piece. Nicole had chosen the prettiest floral fabric for her PJ pants. 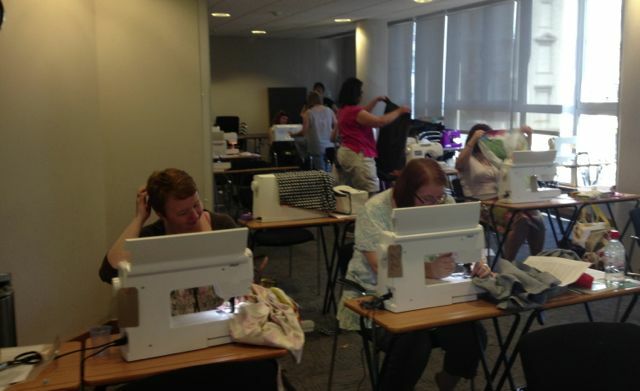 Hard at work, Moria, Shevvy, Gina- about to try on- an essential part of the class! Pennie almost finished hers in the 3 hour class and many people got to the final heming stages that could be finished at home. I loved teaching this class. It was calm and funny. Rachael made me laugh by giggling everytime I said crotch which was often. There were lots of different skills being mastered from pattern tracing (Jan brought Burda paper along for this which is tissue style paper,very light, available here and a cheaper option if you don't' want to invest in Swedish paper), size alterations- lengthening/shortening/grading sizes, making a muslin so the next pair will be just right, using tricky fabrics like voile and corduroy. So many different pairs! Catherine finished these when she returned home to take away on holiday straightaway. 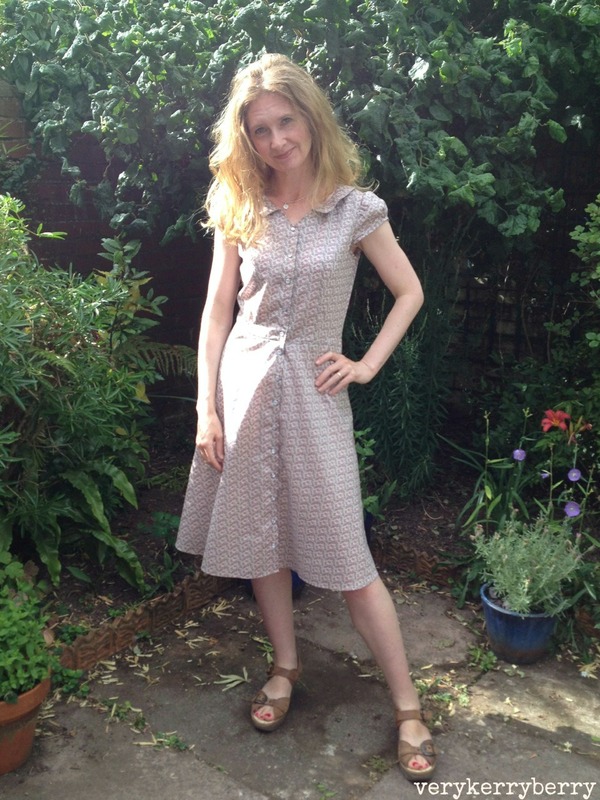 Sonia completed hers with hand finished hems. I was so proud at what everyone accomplished and I'll be back with more dressmaking next year at retreat, maybe something a bit more boudoir themed! 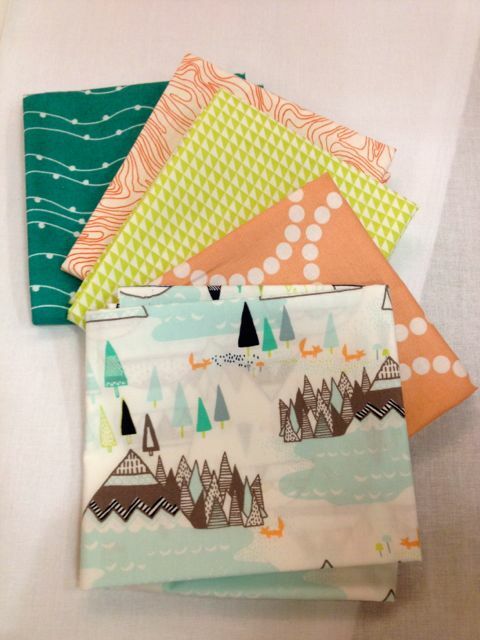 On Saturday morning I taught two shorter tabletop classes back to back. 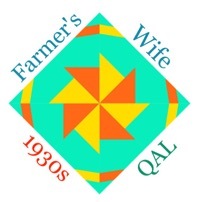 These had an early 9.00am start but the sight of 100s of fat quarters all supplied by Annie at Village Haberdashery circling our table compensation! 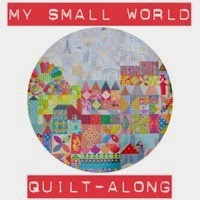 These photos were taken by Sarah of Quilt Candy. 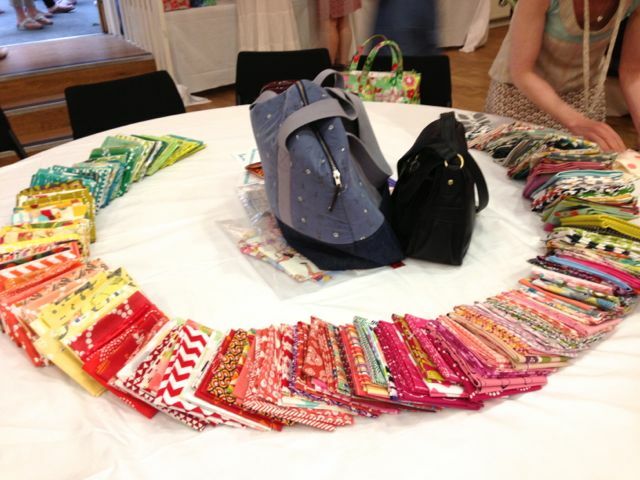 My handy Aeroplane bag is in the centre of the table- I used this all the time, perfect generous size for class supplies! We covered a lot in a short space of time. A little colour theory and a lot about value and contrast. The last 30 mins of the class were about picking bundles and moving away from their usual comfort zone of colours and patterns and into something a little riskier. 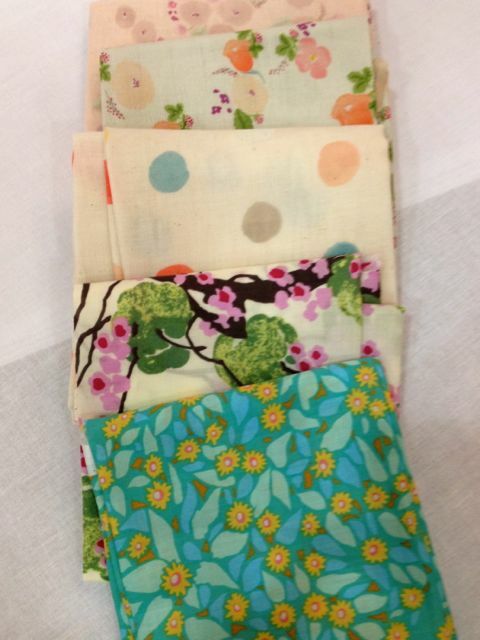 Some chose to buy their bundles too and the wonders of technology when I could photo them, send straight to Annie, she printed out the pic and made up the orders that evening in the quilt market! 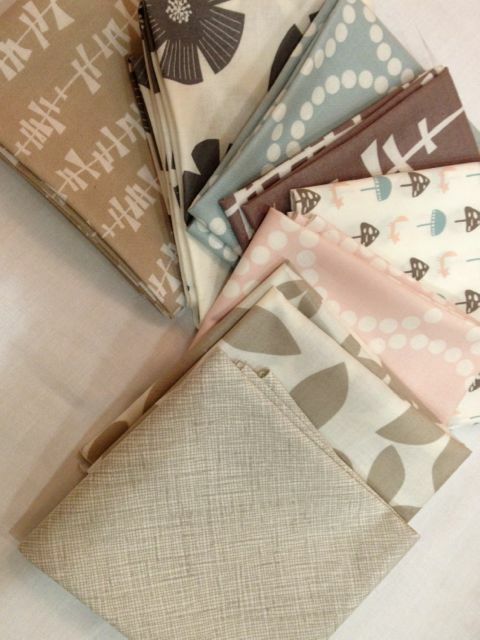 By Sarah: A lovely neutral ice cream collection that Annie put together 2 of and sold another as it was such a pretty selection. 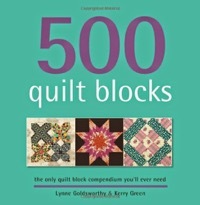 Includes Glimma, amongst others. 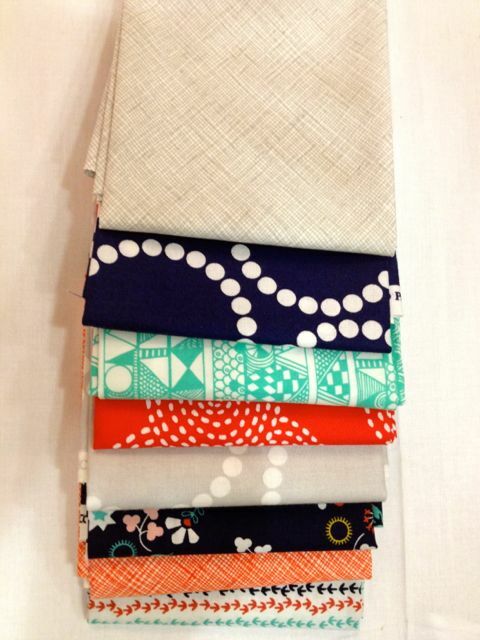 I liked this bundle for the range of scale and consistnecy of colour whilst using several fabric ranges. Stof beaded wave was popular with many, as were many of the Stof fabrics, the Indian summer prints at a little cuteness and Pearl Bracelets support again! 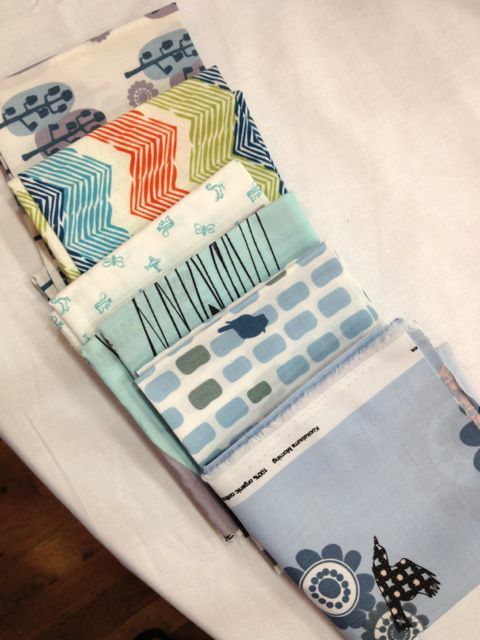 A beautiful selection of voile and double gauze- you need to touch these to feel the full benefit. A lot of story telling in this bundle with figurative prints- Stof Uno Raindrops was a very popular fabric, as seen here in lemon and Glimma trees, also much chosen. This print was generally popular by itself and with others, Sevenberry Miniature Cats and Dogsand the animals are really tiny! 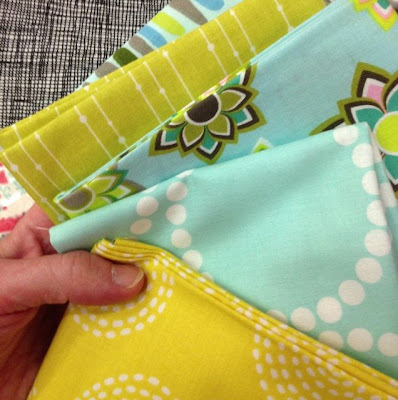 If you see any fabric here that you like, do get in touch with Annie- there were a few that were the last of the line but there are many others, including great blenders and basics that she has plenty of in stock. 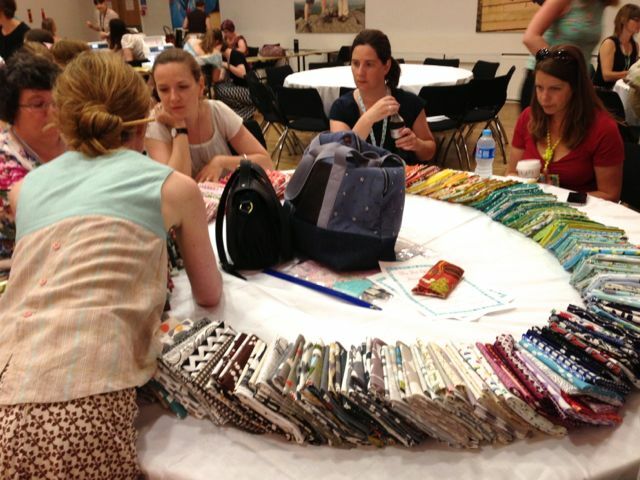 The tabletop sessions were a new addition and they offer a lot of potential in teaching. We had really interesting discussions about colour in both groups and it is always fascinating to see the variety choice and preference. When I first saw the new Colette pattern, Hawthorn, I gave a little squeal, a semi circle flared skirt is very much my style, the neckline is modest for my rather bony décolletage and having had such a positive experience with my Bleuet shirt dresses (here and here) and with the further incentive of a sew-along it tipped me over the edge and I ordered it straightaway from Village Haberdashery. 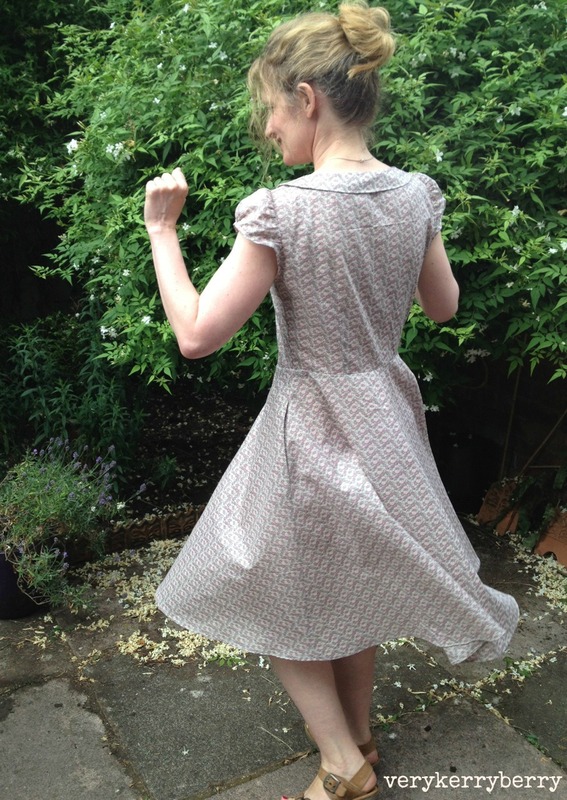 There was a delay waiting for snaps to arrive but now I have finished it and felt very much like a lady when I pinned my hair up, put on my wedges and twirled in the sun. 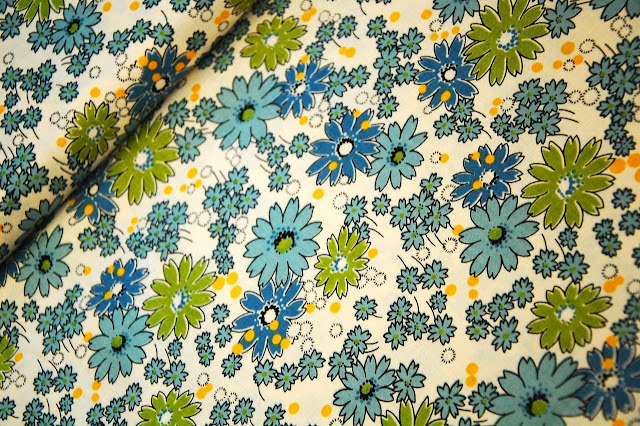 The fabric choice for this dress is critical, it needs to be lightweight enough to swish and swirl, but not see through- I didn't want to line it- so I chose Liberty Lawn. 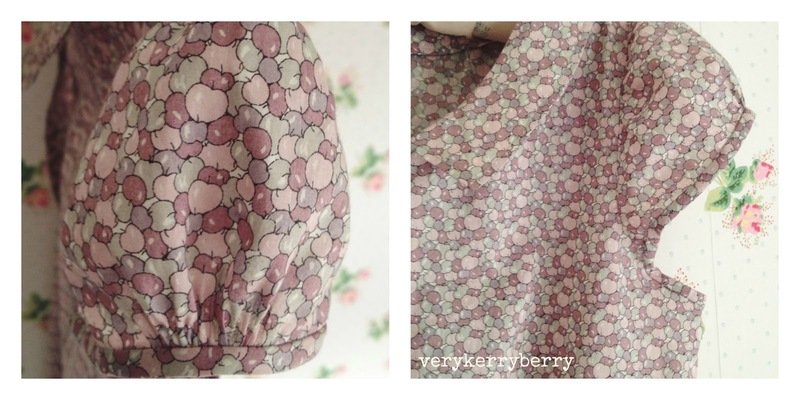 The tiny apple print is a one way pattern which is always an extra challenge with large half circle skirt pieces but I played around with the layout to make the best of the fabric. 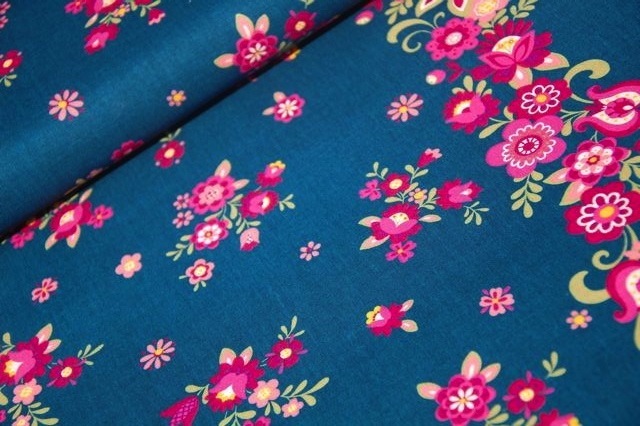 The Coletterie sew-along fabric choice post is very helpful and I did order samples from Croft Mill, which has great dress making fabrics before settling on what was already in my stash. My fabric has a frisson of transparency- just enough to make sure my underwear is a light and blending colour but not enough to make me fear standing in bright sunlight. I added side seam pockets using the Burda Theresa dress pattern from last summer's dress making, I've got to have pockets whenever I can. You can see how they disappear into the seam in the swirl shot below and also where the uppper back bodice could do with an extra press! 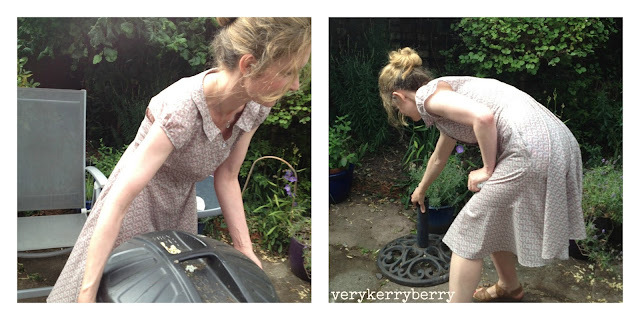 I have done a lot of dress making this summer so my skills have really sharpened up , there is nothing like lots of practice to make dusty techniques come back to life. 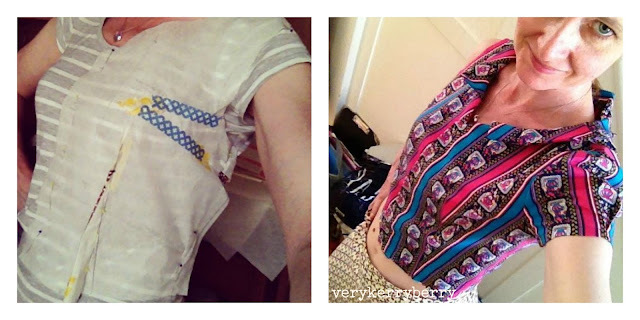 I started with a bodice toile as I have a very small bust and Colette patterns are cut for a C cup. 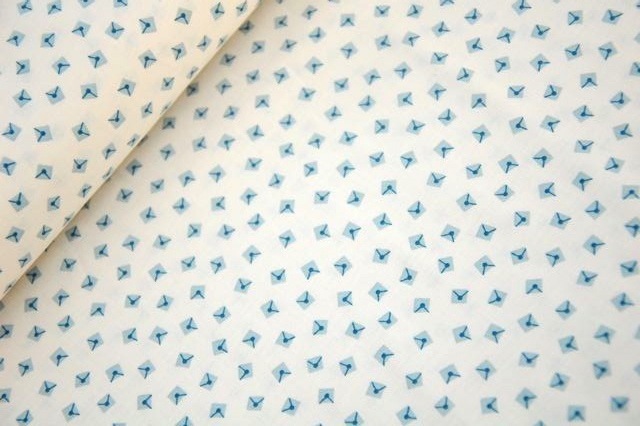 I traced off a bodice in size 2 graduating to a 6 in the waist as I like a lot of ease there, especially in a shirt dress. Swedish paper is the only thing that keeps my sanity when doing fittings as it is always a little leap in the dark when you start cutting and taping darts. I did shrink the width of the waist dart and increase the length so it reached the nip (you know where I mean) as this works best for me. The key factor for me is to measure the waist either side of the dart and make sure this stays the same after I have sliced the dart. The bust adjustment post at Coletterie was very detailed and it was worth taking time on this even if it was over 30 degrees C as the end fit was excellent on the front bust and I didn't need to change the back darts. When I added the side pockets I consulted the trusty Readers Digest Guide to Sewing which always has some nifty tricks- although they tend to be time consuming ones. 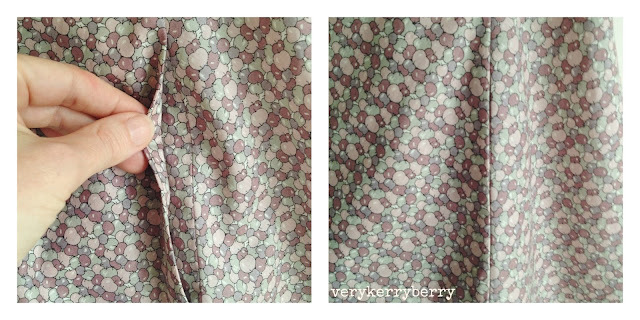 When I sewed the pocket facing/linings onto the side seams I used a scant 5/8" seam allowance, almost a 1/2" just to give a little room for the seams to roll back and hide the pockets completely in the dress. It worked treat! 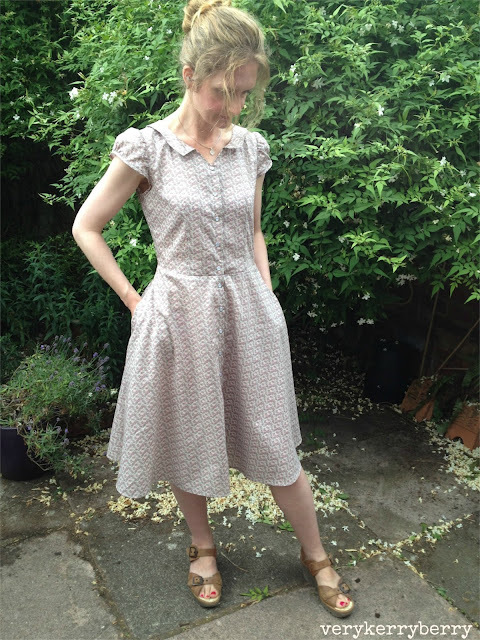 There was a heatwave in the UK whilst I was making this so I knew long sleeves were out of the question- although I want to try a plaid version for winter complete with plackets and cuffs. 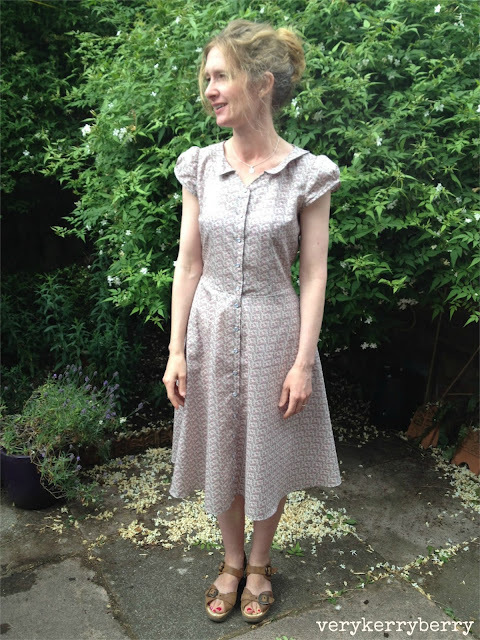 I had tried the short sleeve in the toile and it fitted well but wasn't quite ladylike enough and sleeveless leaves me feeling a little too exposed so I opted for a cap sleeve following the superb drafting instructions from Jenny Gordy which gives it additional fullness and a neat bias binding finish around the lower armhole and the sleeve edge. I added gathers to make a gentle puff effect and so the sleeve would hug the upper arm for wearing a cardy (lets be realistic, in Britain a cardigan is never far away), and I was very happy with the finished effect. 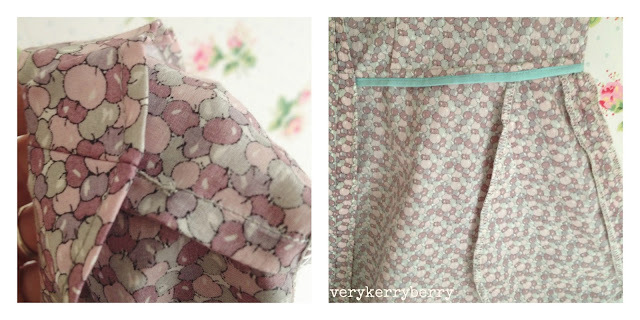 One of the biggest pleasures of dress making is adding the little touches that would never be in a shop bought dress, seam tape on the inside waist edges, adding a french tack to hold the facing gently to the shoulders, french seams at the shoulders and sides- it all makes for a very neat inner and a more durable garment as ultimately my dresses ends up in the washing machine frequently over the summer. I did have a few glitches and struggles, mainly with the collar and this was noted by other sew-alongers in the flickr group. 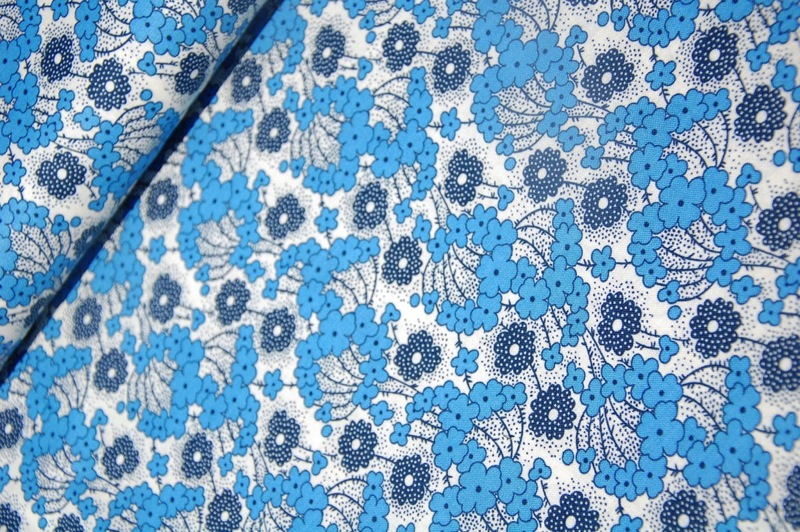 The collar facing along the front neck was 1/4" longer than the collar/dress it is attached to. I didn't notice this in the toile as I hadn't stay stitched or interfaced so there was more give in the fabric but I did have to get creative and notch the short section to trim. I think I would do the collar in a single section next time too. It uses the fabric more efficiently in 3 sections but I think it would lie a little better if made in 1 piece. 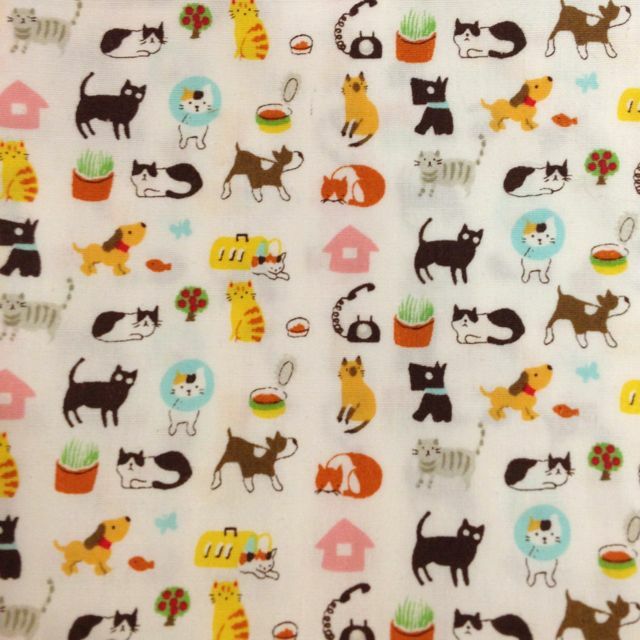 I took a lot of time with interfacing, (so tedious, but worth it) and used a lawn cotton fusible. I also used a narrow double turn hem following Gertie's method which is always my preference for a swirly skirt and I allowed time for the hem to drop because of the bias before I trimmed it level. 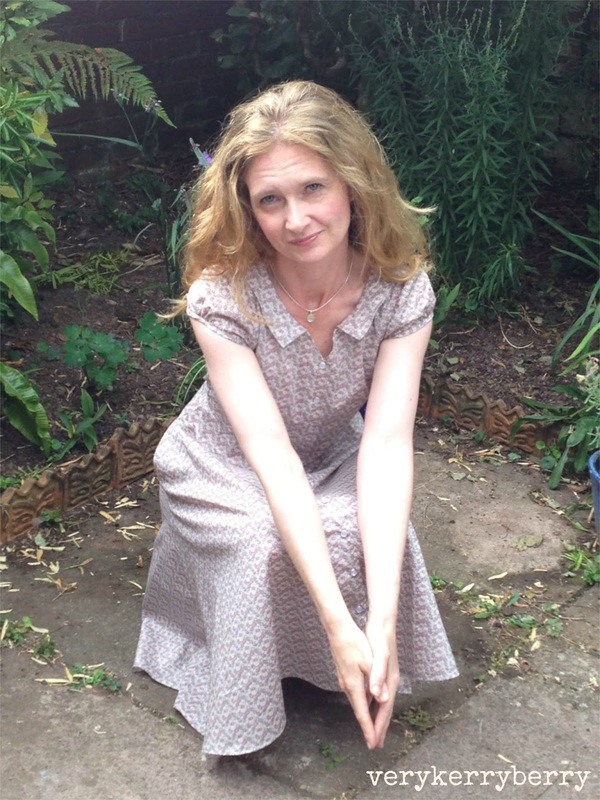 And a few more realistic photos: our garden is really a tiny yard so there was a little shifting around in the photo session (ably lead by my daughter) so you can see the dress moves around easily in more every day activities! 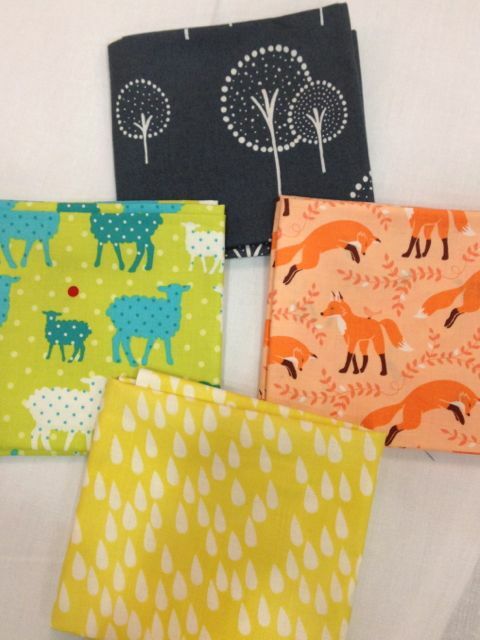 You can see other Hawthorn's here, are you tempted to make one?